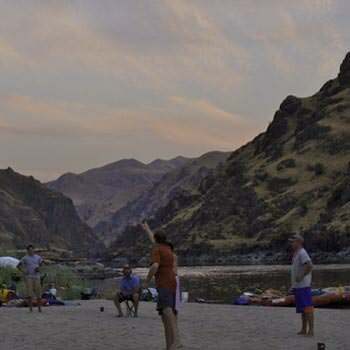 Camping on the Snake River in Hells Canyon: The Easy Way! 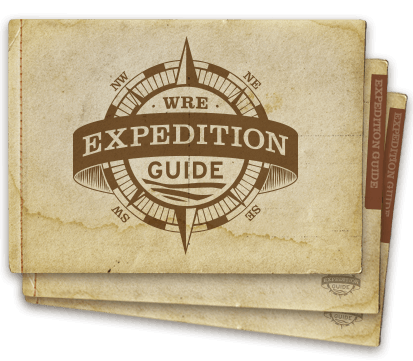 On a Snake River rafting trip, a cargo raft will go ahead of the main group each day carrying camping gear, food and supplies. This allows our smaller rafts to be lighter and more maneuverable, which makes for a safer ride with more bounce and splash. All you have to do is carry your personal gear to the tent of your choice and roll out your sleeping bag, flannel liner and thick, self-inflating foam sleeping pad (all of which is provided by the tour operator and stored in a waterproof bag). To give you the opportunity to go hiking, fishing, read a book, etc., we generally arrive in camp no later than 4:00 pm. Around 5:30, we serve hors d'oeuvres with dinner following around 7:00 pm. Freshly laundered sleeping bags, sheets and a pillow provide comfort. You'll receive your personal sleeping bag along with sheet and pillow at your orientation meeting the night prior to trip departure. Paco pads are self-inflatable and make sleeping and relaxing on the river easy. Tents are always available. On most trips, they will already be set up for you when you arrive in camp. You may be like many of our river guests who prefer to sleep under the vast canopy of stars. A ground cloth keeps your gear and camping areas clean. This can be placed under your tent or Paco pad at night. Your rafting adventure will have a "porta-potty" system set up each day in a secluded location that assures privacy. This is essentially a toilet without the fancy plumbing and is available from the time you pull into camp each afternoon until you leave camp the next day. Along with the toilet, a system to wash your hands with fresh water will be available. Steaming coffee and tea provide welcome warmth to counter the cool sand between your toes. You might think you're still dreaming when you see plates of steaming flapjacks, fresh fruit and scrambled eggs, but it's the way every morning on the river begins. Your guides are not only trained river professionals, they're talented campfire cooks as well. Hand selected fresh fruit and vegetables are carefully packed for meals throughout each day. Ice coolers will carry fresh dairy products and meats. From these ingredients, you will have hearty, healthy meals prepared. A wonderful selection of fresh meats and cheeses, delicious bread, along with crisp vegetables and a variety of spreads satisfy hearty lunchtime appetites after a morning in the canyon. Tasty chicken and veggie wraps or perhaps chicken salad pitas may also be part of your mid-day buffet. At all times, unlimited quantities of fresh water is available to quench your thirst. Also, upon making your reservation, you will be asked about your choice of a daily beverage. While you enjoy delectable appetizers and relax at the river's edge, the guides prepare a dinner that is sure to surprise and please. Every night is different, but the menu will likely include Alaskan Salmon, Prime Rib, lasagna, Idaho mashed potatoes, tossed green salad with your choice of dressing, vegetables, and side dishes. Dutch-oven cake and cobblers or other scrumptious desserts deliciously top off the evening meal. A moderate amount of wine is served at dinner. You will also be provided two beers, two sodas or juice per person per day. You are welcome to bring your own beverages as well.